Well, this certainly gives new meaning to the phrase “cool beans.” And, it takes our love of coconut water and coffee to the next hydration level. 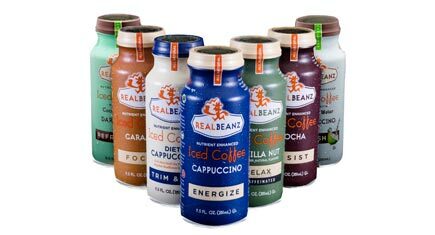 And it gives us a new funky option of how to spell “beanz.” Say hello to RealBeanz Iced Coffee Made With Coconut Water Cappuccino Refresh. Yes, it may be the longest title of a drink ever, but it’s worthy of a long title. A genius mix (seriously, why didn’t we think of this?) of premium-roasted coffee beans and oh-so refreshing coconut water, this stuff comes in a nice glass bottle and has a slightly sweet, slightly salty taste with an itty-bitty aftertaste of erythritol and stevia. Available in Cappuccino or Dark Roast (both are delish), they have 70 calories, about 1 gram of fat, 15 grams of carbs (5 grams of sugar alcohol, FYI), a couple grams of protein, and enough sodium and potassium to be considered a good electrolyte drink for after sweaty workouts. While the ingredient list isn’t super-duper clean, it is 100 percent natural. And it’s a really nice treat after a good sweat session (especially if said sweat session is in the morning!). RealBeanz has lots of other flavors, too, that are infused with all kinds of good stuff like chamomile and ginkgo biloba. There’s a low-cal line, one to help you focus, another to help you chill and another to boost immunity. While some of them do have more sugar than we’d like (the Caramel Focus has 140 calories and 26 grams of sugar), they are a nice treat—and certainly a healthier twist on your usual sugary coffee shop faves. Not to mention, if you’re looking for a way to try coconut water without, you know, really tasting it (ahem, Erin), this is a good way! I still haven’t been able to find a coconut water that I like, let alone putting it into my coffee !